The Nordic Pure MERV 12 anti-allergen pleated air filter is the ideal filter to reduce airborne contaminants in your home or business. With each pass through your MERV 12 anti-allergen pleated air filter, the air in your environment improves. This electrostatic air filter attracts and captures airborne dust, pollen, mold spores, pet dander, smog, dust mite debris, and baking flour. The MERV 12 anti-allergen pleated air filter is made of synthetic material that will not support the growth of mold and bacteria. Along with the reduction of dust on surfaces, this MERV 12 anti-allergen pleated air filter is a high efficiency filter that will attract and capture the small, allergy-aggravating micro-particles that can cause your family discomfort. 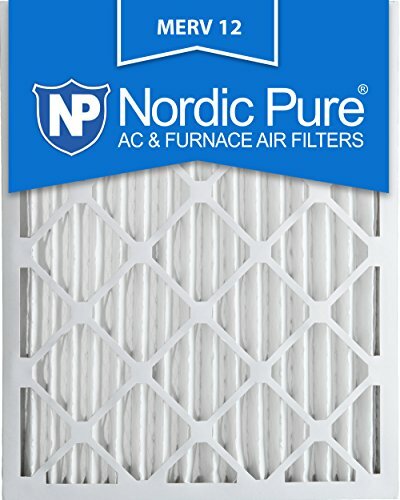 The Nordic Pure anti-allergen pleated air filter has a Minimum Efficiency Reporting Value(MERV) of 12 which means that it will collect more than 90% of 3.0-10.0 microns of contaminants, and up to 90% of particles 1.0-3.0 microns. Particles in indoor air are measured in microns, which are 1/1000 of a millimeter. A human hair is about 70 microns wide. The MERV 12 anti-allergen pleated air filter is comparable to a filter with a MPR rating of 1500-1900 and is a great start to creating a healthy environment. Because of the high efficiency changing your MERV 12 air filter on a regular basis will not only make your environment healthy, it helps keep your air conditioning and heating system running more efficient. We recommend that you change your air filter every 30-90 day depending on individual conditions in your home.